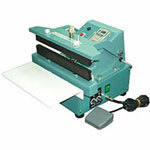 This hand held roller heat sealer is ideal for the sealing of polyethylene or cellophane material. 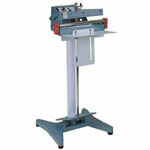 It has a 2-1/4" diameter ptfe fabric coated wheel that can be rolled on to the material to produce a strong seal. 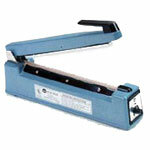 This hand held roller heat sealer can create a round oval or square textured 9mm seal. 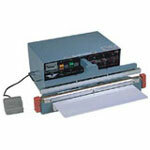 It has an unlimited seal length and an adjustable temperature range that can be set from 150°F to 300°F.